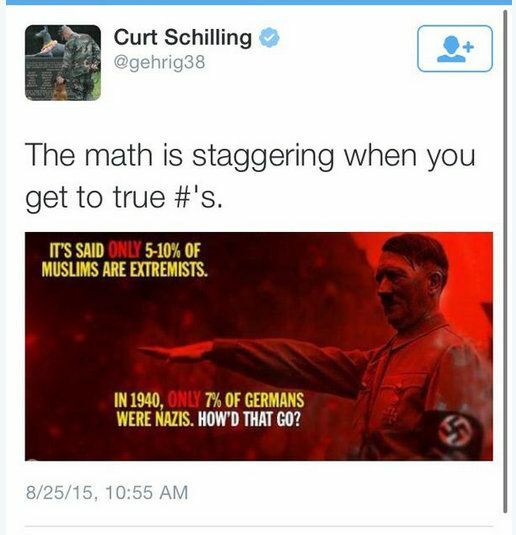 Curt Schilling got in trouble with his employer [ESPN] for tweeting a comparison of the number of Muslim extremists that might exist today vs the number of Nazis in 1940. [May I suggest Stalin or Pol Pot for future attempts at evil equivalencies?] The move comes just in time to be part of the upcoming paperback edition of Kirsten Powers’ book, The Silencing. In short, another example of the type of political correctness which is driving my fellow Republicans so insane, that they are actually telling pollsters that they would support Donald Trump for President. Don’t worry, I know you guys are kidding. Right? But on the other hand [while I still have one, pending Sharia law implementation for blogging excesses which may offend the Profit [see what I did there? ]], its an opportunity to highlight the very point Schilling was attempting to make. Back in late 2014, the comedian Bill Maher had writer Sam Harris on his HBO show and together made it a point to note the problem is not just about Islamic terrorists, but the populations in predominantly Muslim countries which adhere to fundamentalist Islamic views [Sharia law]. Afterwards, conservative commentator Ben Shapiro put together a 6 minute video which highlighted the points made by Maher and attempted to quantify why the problem is not limited to active terrorists, but the many extreme aspects of Sharia law, belief in honor killings, etc. See below. Shapiro’s aggressive estimate of Muslims with extremist views was 72%, or 680 million. But using Politifact’s more lenient criteria, the estimate dropped to 19%, or 181 million. But still we’re talking about 181 million people. 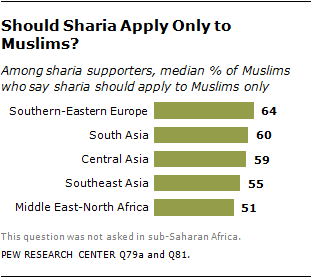 The gist of Schilling’s tweet was that even if it’s only 10% of Muslims, it’s still a big problem. Finally we get to the humorous part of the blog post. Even using criteria intended to downplay fears about Muslims with extremist views — Maajid Nawaz has coined a more useful description, “Islamists” – Schilling’s estimate was on the low side by almost 100%. Hey, maybe that’s why he was suspended? A few bloggers I read on this issue are listed below. Sobering stuff, but that Martin Niemoller quote has long haunted me. H/T to Wichi re the blog post title. As with testimonies, any allegedly stolen ideas are now strictly property of the blog. This entry was posted in 2TG Favorites, Current Affairs & History and tagged Ben Shapiro, Curt Schilling, ESPN, Islam, Islamists, Joseph Stalin, Kirsten Powers, Maajid Nawaz, Martin Niemöller, Muslims, Pol Pot, Sharia Law, The Silencing, Wichi. Bookmark the permalink.